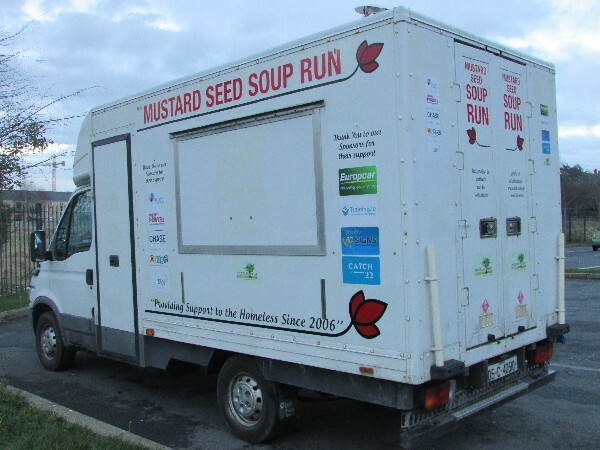 Due to the very generous support from the Mustard Seed’s sponsors over the past year in particular, they are now providing hot food, warm clothing and friendly chats to the greater Dublin area, 7 nights per week, becoming the only Soup Run in full swing 7 nights a week. With the invaluable support provided by people like you and me, alongside their amazing volunteers, they now go to areas where previously other Soup Runs were unable to reach. They provide warm food not just to the homeless, but to other Soup Runs such as; Hope into Darkness, Cedar House, Simon Foot Patrol and Peter McVerry's Teams in the inner City every night. With the help of the Mobile Soup Run Van, the Mustard Seed now provides direct care and support to over 200 people in the homeless community and indirectly supporting many more. The Mustard Seed Soup Run is part of the 2016 Belong Together Video Competition for Non Profit Organisations. Their 2 minute video which can be viewed here gives just a quick overview of the incredible work these volunteers do every day on the streets of Dublin. By their nature, the Mustard Seed are not well known and therefore, need your support to get as many votes as they can to win the competition of €1,000. In their hands, €1000 will support hundreds of individuals through the harsh winter ahead. The Mustard Seed team will continue to give their time to the homeless, will you give them your vote? - One click can make all the difference, bringing this great project closer to some much needed funds.